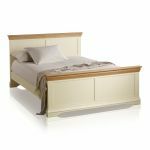 The Country Cottage Natural Oak and Painted Super King-Size Bed is designed to make a big statement in any bedroom. 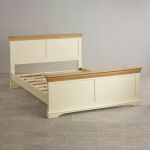 Distinctively painted with natural solid oak tops, the head and footboards are expertly crafted with flared cornices, softly rounded edges and arched bases. 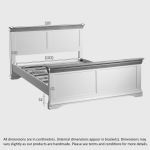 Only the finest premium grade solid hardwood is used throughout; including the slats, which are reinforced midway for reliable strength. Team this beautiful painted bedstead with any of our super-king size mattresses and you'll have the perfect combination of style and comfort. Why not check out the rest of the Country Cottage range to discover matching items of painted furniture for every room in your home?